Team-based care is important to the future of health care. It has shown to improve clinical outcomes, provide better access to care, improve support for complex patients, and reduce provider and staff burnout. In a team-based care approach the care of the patient is coordinated and managed by a team of staff and providers, that focus on the whole person. There is high level of communication and coordination within the care team and with the patient/family. Clinical staff such as medical assistants and registered nurses work at the top of their license allowing providers to have more meaningful encounters with patients. JSI with external partners, Leibig-Shepherd, LLC, Kaiser Foundation Research Institute, and the Colorado Community Health Network, serves as the technical assistance partner (TAP) for The Colorado Health Foundation's Team Based Care initiative. The TAP is assisting a cohort of primary care practices (nonprofit and private safety net providers) to optimize existing care teams to deliver coordinated, high quality care by working collaboratively with patients to accomplish shared goals. 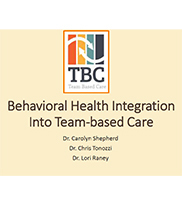 Many resources have been created for the initiative, including a change package and one-pagers for each of the major concepts of TBC (note related resources below). In addition, JSI produced a video for Peak Vista Community Health Center, CO, to share their success to date with the team based care approach.